The Zinesmate Tokyo Art Book Fair 2016 starts next week (Sept 16th)and I’m frantically trying to get my books done in time. I’ve decided to make fewer books this year but I’m enjoying my projects. Here is a sneak peak at the contents of one of my mamebon (bean-books, so called because of their small size). This book will be 5cmx5cm when finished. This is the screen shot of the photos to be printed. I really like bees for some reason. I suppose it’s because I now understand how important they are for the environment. Still haven’t gotten over my fear of wasps and hornets. Baby steps. I haven’t seen many bees around my neighbourhood in Tokyo this year. Other years I’ve seen many bees around the hollyhocks and cosmos. This year? Not so much. Occasionally I’d find bees enjoying the lavender I planted. Anyway, it’s back to work. I’ll post more info on the time and date of the TABF 2016 this weekend. If you’re going to be at the TABF, drop me a line. I’ll be with Art Byte Critique again this year. 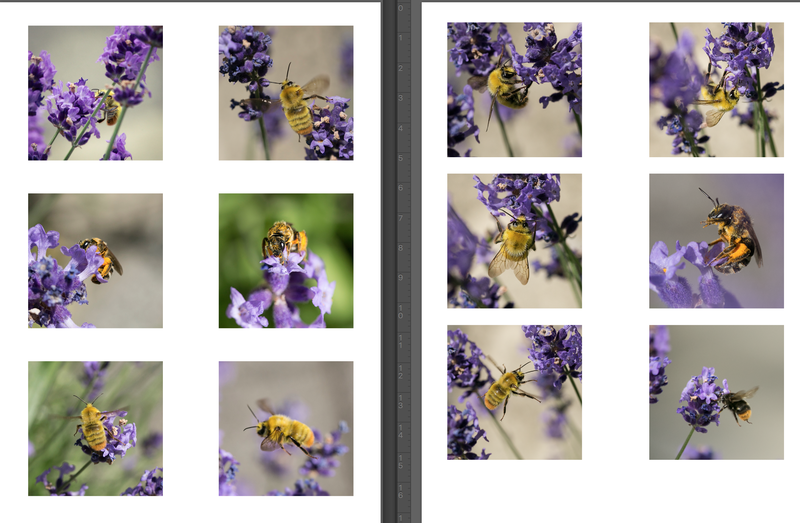 This entry was posted in bookmaking, Canon 5D Mark III, Photography, Tokyo and tagged bees, lavender, making books, TABF 2016, Tokyo, Tokyo Art Book Fair 2016, urban bees, Zinesmate. Bookmark the permalink.